Twelve years ago during the month of August I fractured/broke my lower back while mountain biking in Redwood National Park. The crash was the most traumatic physical experience of my life. Seven hours passed between the time of the crash and the time I arrived at Mad River Hospital in Arcata California. During those seven hours I often wondered if this serious injury would end my teaching career or disable me for the rest of my life. At the time of the injury I knew it was serious because I couldn’t get myself up. Last summer I hit rock bottom regarding my weight and my back. 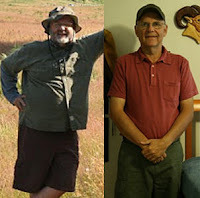 I ballooned to about 230 pounds and was forced to abandon my annual camping trip after 36 hours due to the and the inability to barely get up off the ground in the morning. I had to use a cane to lift my body up and one morning I didn’t think I was going to be able to get up at all. So, what happened? I believe there is often more than one way to describe or interpret an event. On one level, one could say my personal physical transformation is best described as a miracle. I wouldn’t quibble with that. I still frequently look at myself in the mirror and ask who is that guy, good looking mind you, who is staring at you in the mirror? From another perspective, one can attribute the change to a lot of hard work, perseverance and discipline Personally, I embrace both perspectives but would add the element of mystery. I don’t know why I was able to break through at this particular time in my life. I wasn’t particularly motivated anymore than any other time in my life and I didn’t really do anything new I hadn’t tried before. It’s a mystery to me. If you want to learn more about what Bill specifically did I suggest you read his post.. and join me in saying "Way to go Bill".. and thanks for providing some inspiration for us today! Way to go Bill ~ You are truly an inspiration! !